"With LinkMachine I got a bigger return on less time spent. WIN-WIN! Thanks again!" "Thank you so much for making such a phenomenal program, one that's easy to use and oh so functional." "LinkMachine is an outstanding application. It's by far the easiest and most effective link management application I've tried." "I just want you to know that your program is FANTASTIC! I've been using it for about a week now and the interface is so easy to use. Everything I've been looking for in a link exchange program is right here in your free software." 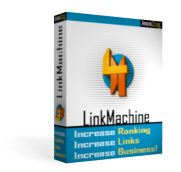 "LinkMachine is exactly what I had been searching for. It's fast, easy to backup your data, creates static, search engine friendly pages and best of all, I can manage all of my links quickly and with little effort thanks to the built in email forms. Thanks again!" "I am very happy with the software and customer support. LinkMachine would be beneficial to any business." "The LinkMachine program has been more than what I was looking for. Simple, straight forward and easy to install. Customer support has been very responsive too. I'd highly recommend it." "I can find and request link exchanges with content relative sites in no time... well worth the one time fee for this continued value." "LinkMachine is like having your own 'link exchange secretary'... you can set it and forget it!" "As a small business person on a tight budget just starting several websites, LinkMachine was just the solution I was looking for... The software works well for a person who is not very technical, and creates professional looking link pages." "Linkmachine has made link exchanges a breeze with an easy layout and powerful features. I give it an 'A'." The key to success for a web site is good search engine ranking. All of the major search engines use link popularity to determine how well a site will rank - so the more high quality, relevant links that lead to your site, the higher it will rank. LinkMachine makes it easy to get the links you need by helping you establish hundreds of quality, relevant link exchanges. The most effective way to interest webmasters in linking to your site is by offering to exchange reciprocal links. This is a win-win situation - both of your web sites benefit from new targeted, relevant links. LinkMachine helps you build as large a reciprocal link program as you'd like. Search engines see all of the new links pointing from other quality, relevant sites to your site, and increase your rank. Note that this is very different from using indiscriminate "link farms", which will give you no advantage with the search engines. Google recently revealed the secrets of its search ranking technology by filing a patent application. What we found out is that Google values organic link building - link building that progresses naturally rather than appearing artificial. LinkMachine is the ideal tool for building link exchanges the way Google likes them. LinkMachine's InstantLinks system and link search tools allow you to grow your link exchanges gradually and gain links from many different sites. And with LinkMachine's Alternate Profiles feature, you can easily benefit from having the links to your site use a diverse variety of anchor text. Building your site's link popularity doesn't have to mean tedious hours spent gathering links, writing e-mails, and checking that sites you link to still link back. LinkMachine automates every step of the link management process. New links come to you! Your site's visitors can submit new links through LinkMachine's submission form. LinkMachine can inspect each link that's submitted and only accept the ones that meet your requirements - filter out links with inappropriate content, links with low PageRank, and much more. Plus, as soon as you start using LinkMachine, you can invite other LinkMachine users to exchange links. In fact, many of them may take the first step and invite you! With a single click you can accept an invitation and build a new link exchange instantly. Exchanging quality, relevant links couldn't be easier. To find even more potential link partners, you can search by keyword for related sites and send out link exchange invitation e-mails based on customized e-mail templates. You can even find out what sites are linking to your competitors and invite them to exchange links with your site as well! Make sure sites continue linking to you - without wasting time. LinkMachine will regularly check each link to your site to make sure that it hasn't been taken down. If a link is found missing, LinkMachine can search the rest of that site for the link, in case it's just been moved to another page. And if the link is nowhere to be found, LinkMachine can automatically send e-mail notices to the site's webmaster, and finally remove the link. Your link exchanges can be maintained effortlessly! LinkMachine gives you complete control over the look and feel of your link directory. Easily customize your link pages to match the rest of your site, and choose from a variety of different directory layout styles. With LinkMachine it's up to you whether you'd like to manually approve each link that is submitted, or run your link directory on full automatic by setting link submission requirements so that LinkMachine can accept or reject each link exchange automatically. LinkMachine generates a fully searchable link directory with as many categories and subcategories as you'd like. LinkMachine will read your existing link pages and add their links to its own list of links. And if you're using a link management tool now that can export your link database as a .csv file, you can import the links directly into LinkMachine that way. Because LinkMachine is a PHP application that runs from your web site, it can update your link pages the moment you make a change, or the moment another site's webmaster chooses to exchange links with you. This means no need to upload new versions of your link pages. It also means immediate feedback for webmasters making link exchanges with you. Have you ever wondered how the websites that rank higher than your site in the search engines got there? Hire an expert in search engine optimization (SEO) to do the research for you, and he'll look at each factor that contributes to a page's search ranking: keyword density, meta tags, page title; quality, quantity, and anchor text of incoming links, and more. After a lot of number crunching (and a big bill), they'll be able to tell you what you need to do differently to match the successful strategies used by your competitors. With LinkMachine's SEO Wizard, you don't need an expert to dig through all that information and put together a list of simple steps for improving your site's ranking. SEO Wizard does it all for you. Just enter the URL of the page you want to optimize and the search phrase that you're optimizing for, and SEO Wizard does all the research. It can examine tens of thousands of web sites, looking at all the same information that the search engines use to determine how your site will rank. By comparing the results for your site with those for your more successful competitors, SEO Wizard produces a simple step-by-step guide for increasing the search rankings of your own site. We've all done it  plodded through dozens of pages of Google search results, looking for the link to our site. It's crucial to keep track of each site's search rankings, to find out what difference our optimizations make to the rankings, and what difference the rankings make to the site's traffic numbers. But trudging through those search results regularly takes time that's better spent improving your site and building links. Let LinkMachine's Rank Tracker take over this job for you. RankTracker can track the search rankings of any page for any search phrase, and show you a graph of the changes in ranking over time. Set up Rank Tracker to check on each ranking at regular intervals - once a week, even once a day to monitor every fluctuation. Rank Tracker will not only track search rankings in Google and all the other top search engines, it will also track the number of incoming links to your pages, the PageRank and Alexa rank of your site, and more. Don't waste your time pouring through search results to track your progress - let Rank Tracker do it for you. Links leading to your site form other sites  incoming links  are the single most important factor affecting how well your site ranks in the search engines. It's important to know how many incoming links your site has, how they break down by PageRank, and what anchor text is used in these links. It can take days to put together all of this information yourself. But LinkMachine's Link Analyzer can do it in minutes. Link Analyzer will examine every incoming link to your site and show you a breakdown of all your links by site, PageRank, and anchor text. Find out what keywords are neglected and need to be used in more incoming links, and discover how much diversity there is in the anchor text. (Remember, Google loves anchor text diversity). What's more, you can have Link Analyzer give you the same in-depth look at your competitors' incoming links. Discover what sites link to your successful competitors - and send out link exchange invitations to these same sites! You can build upon the power of the free Basic version of LinkMachine to suit the needs of your site. The LinkMachine Premium upgrade is perfect for managing a large, automated link exchange directory. LinkMachine SEO will give you a step-by-step search engine optimization guide to ranking higher, and track your site's progress. Here's a snapshot of how the different versions of LinkMachine compare. For a complete list of features, click here. Go ahead and install the full version of LinkMachine (it's not a crippled demo version). It's yours for free, to use as long as you'd like. You also receive a 10 day free trial of LinkMachine Premium and trial versions of the LinkMachine SEO search engine optimization tools. 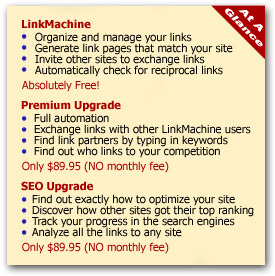 LinkMachine can be used on up to three different web sites. Additional web site licenses are $10 per individual site, $50 for a block of 8 site licenses, or $200 for a block of 50. After upgrading LinkMachine, if you're dissatisfied for any reason, there's a 30 day full money-back guarantee. You can't go wrong! We're sorry to announce that development and sales of LinkMachine have been discontinued. If you're a LinkMachine user, don't worry -- LinkMachine will continue working normally, and support continues to be available here. Documentation and the rest of the old LinkMachine site are available here. 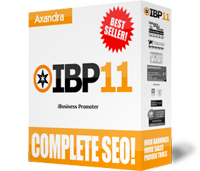 If you're a web site owner or developer looking for a full featured SEO and link management product similar to LinkMachine, we recommend iBusiness Promoter 11. Thank you for your business over the past seven years, and we wish you continued success!